Commercial & Residential Service- No job too big or small. Maintaining a septic system is good for the environment and for your wallet. Fast, Reliable 24-Hour Emergency Service! Baker Septic is family owned and operated with 30 years of experience and is proud to be providing residential and commercial septic services to Washington residents. 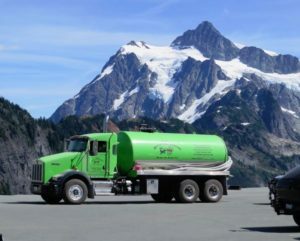 Baker Septic provides service to Whatcom, Skagit Island and Northern Snohomish Counties maintaining a fleet of 1,000 to 4,000 gal vacuum trucks. Top notch customer service is our commitment and we take the time to communicate your septic system issues and needs with you. We work and live here and we enjoy and care for our community in every way; we use safe environmental practices for a green future for generations to come. Our friendly service technicians are professional, highly trained and ready to help with 24-hour service, 7 days a week as well as emergency service including weekends and holidays. Call and a Baker Septic family member will always answer giving you a competitive price and the septic solution that is right for you!